نبیونی, غلامرضا, حسین آباد, طاوس, هدایتی, کامبیز. (1395). مشخصه یابی و مطالعه ناهمواری سطحی بس لایه های Co-Cu/Cu و Fe-Co-Cu/Cu الکتروانباشت شده بر زیرلایه شیشه/طلا. نشریه علوم و مهندسی سطح, 12(30), 75-85. غلامرضا نبیونی; طاوس حسین آباد; کامبیز هدایتی. "مشخصه یابی و مطالعه ناهمواری سطحی بس لایه های Co-Cu/Cu و Fe-Co-Cu/Cu الکتروانباشت شده بر زیرلایه شیشه/طلا". 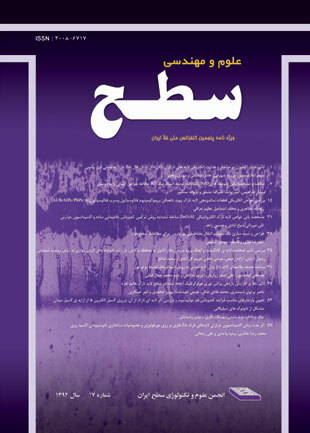 نشریه علوم و مهندسی سطح, 12, 30, 1395, 75-85. نبیونی, غلامرضا, حسین آباد, طاوس, هدایتی, کامبیز. (1395). 'مشخصه یابی و مطالعه ناهمواری سطحی بس لایه های Co-Cu/Cu و Fe-Co-Cu/Cu الکتروانباشت شده بر زیرلایه شیشه/طلا', نشریه علوم و مهندسی سطح, 12(30), pp. 75-85. نبیونی, غلامرضا, حسین آباد, طاوس, هدایتی, کامبیز. مشخصه یابی و مطالعه ناهمواری سطحی بس لایه های Co-Cu/Cu و Fe-Co-Cu/Cu الکتروانباشت شده بر زیرلایه شیشه/طلا. نشریه علوم و مهندسی سطح, 1395; 12(30): 75-85. در این پژوهش بس لایه‌ های Co-Cu/Cu و Fe-Co-Cu/Cu بر روی زیر لایه شیشه /طلا به روش الکتروانباشت لایه‌ نشانی گردید. ناهمواری‌ های سطحی این لایه ‌ها به‌ وسیله میکروسکوپ نیروی اتمی بررسی شده و سپس با رسم نمودار ناهمواری‌ سطحی بر حسب طول اسکن در مقیاس لگاریتمی نوع و اندازه ناهمواری‌ های سطحی مورد محاسبه قرار گرفت. ساختار بس لایه ‌ها توسط پراش اشعه ایکس مورد مطالعه قرار گرفت و پیک‌ های مشخصه و ساختار بلوری لایه‌ ها بدست آمد. رابطه بین ضخامت لایه ‌های مغناطیسی و میزان درصد جرمی کبالت انباشت شده در هر دو بس لایه توسط آنالیز تفکیک انرژی پرتو ایکس بررسی شد. پس از آن اندازه و شکل دانه‌ ها و رابطه آن با ضخامت و مواد سازنده بس لایه ‌ها در هر یک از بس ‌لایه‌های مغناطیسی توسط میکروسکوپ الکترونی روبشی بررسی گردید. در نهایت خواص مغناطیسی بس لایه ‌ها و منحنی پسماند آن‌ها در حالت موازی بر سطح مورد مطالعه قرار گرفت. 1. P. Grunberg, R. Schreiber, Y. Pang, M. B. Brodsky, H. Sowers,Layered MagneticStructures: Evidence for Antiferromagnetic Coupling of Fe Layers across Cr Interlayers, Phys. Rev. Lett. 57 (1986) 2442. 2. J. Noetzel, U. K. Rossler, A. Tselev, F. Prokert, D. Eckert, K. H. Muller, E. Wieser, W. Moller, Preparation of granular Co/Cu by ion-beam mixing of laser-deposited multilayers,Applied Physics A. 71 (2000) 105-107. 3. H. An, S. Takada, T. Sannomiya, S. Muraishi, J. Shi, Y. Nakamura, Effect of substrate temperature on the magnetic properties and internal stresses of CoPt/AlN multilayer deposited by dc magnetron sputtering, Applied Physics A. 113 (2013) 31-35. 4. I. Bakonyi, L. Peter, ectrodeposited multilayer films with giant magnetoresistance: progress and problems, Progress in Materials Science. 55 (2010) 107-245. 5. W. Schwarzacher, M. Alper, R. Hart, G. Nabiyouni, I. Bakonyi, E. Toth-Kadar, Electrodeposited Magnetic Multilayers, MRS Proceedings 451 (1996) 347-357. 6. M. Jafari Fesharaki, L. Peter, T. Schucknecht, D. Rafaja, J. Degi, L. Pogany, K. Neurohr, E . Szeles, G. Nabiyouni, I. Bakonyi, Magnetoresistance and Structural Study of Electrodeposited Ni-Cu/Cu Multilayers, Journal of the Electrochemical Society. 159 (2012) D162-D171. 7. F. Family, T. Vicsek, Dynamics of fractal surfaces, World Sci-entific, Singapore, (1991). 8. M. F. Alamini, R. C. da Silva, V. C. Zoldan, E. A. Isoppo, U. P. Rodrigues Filho, F. D. A. Aarao Reis, A. N. Klein, A. A. Pasa, Norma versus anomalous roughening in electrodeposited Prussian Blue layers, Electrochemistry Communications 13 (2011 1455-1458. 9. G Nabiyouni, B Jalali Farahani, Anomalous scaling in surface roughness evaluation of electrodeposited nanocrystalline Pt thin films, Applied Surface Science, 256 (2009) 674-682. 10. K. Hedayati, G. Nabiyouni, Surface roughness analysis and magnetic property studies of nickel thin films electrodeposited onto rotating disc electrodes, Appl Phys A 116 (2014) 1605-1612. 11. G. Nabiyouni, W. Schwarzacher, Growth, characterization and magnetoresistive study of electrodeposited Ni/Cu and Co–Ni/Cu multilayers, Journal of Crystal Growth, 275 (2005) e1259-e1262. 12. W. Schwarzacher, Kinetic roughening of electrodeposited films, J. Phys. : Condens. Matter 16 (2004) R859-R880. 13. K. Hedayati, Structural and magnetic characterization of electrodeposited Ni–Cu/Cu and Fe–Ni–Cu/Cu multilayer, Applied Physics A 118 (2015) 975-979.